Bangladesh Economic Zones Authority (BEZA) chairman Paban Chowdhury speaks at a meeting between Singapore Business Federation (SBF) and BEZA in the city recently. A business delegation of Singapore on Monday expressed their interest to invest in Bangladesh’s economic zones (EZs) under government to government (G2G) arrangement. 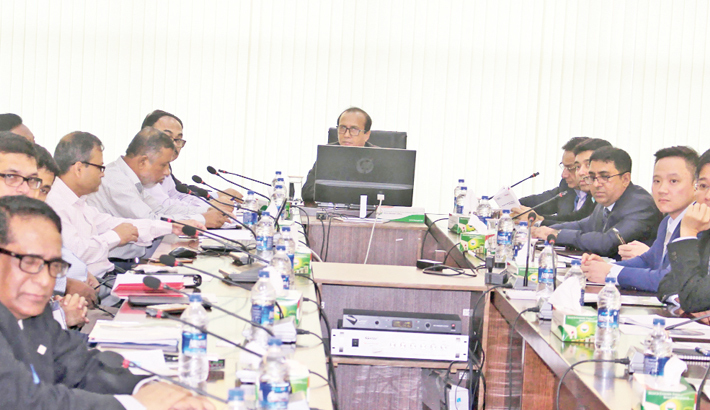 The interest was shown at a meeting between the Singapore Business Federation (SBF) and Bangladesh Economic Zones Authority (BEZA) at BEZA office in the city. A 27-member SBF delegation is now visiting Bangladesh to explore the business opportunities in the country. Most of the Singaporean businesses expressed their interests to invest in the country’s power and energy, pharmaceuticals, ship breaking and service sector under the G2G initiatives. Following the queries of business delegation, BEZA chairman Paban Chowdhury said that they are developing economic zones across the country rapidly and are ready to welcome foreign investors. He also suggested the business delegates to invest in Mirsharai economic zone which will be the biggest industrial hub of the country having 30,000 acres of land. It may mention that the Singaporean businesses earlier sought 100 acres of land at Mirsharai economic zone. In addition with that they demanded 300 acres of land on Monday’s meeting. Business people of Bangladesh-Singapore Chamber and Bangladesh Investment Development Authority (BIDA) were also present at the meeting.